Prince George's County Police and the University of Maryland researchers have created a training program that uses 3-D virtual reality to immerse officers in various situations to test unconscious bias. PALMER PARK, Md. 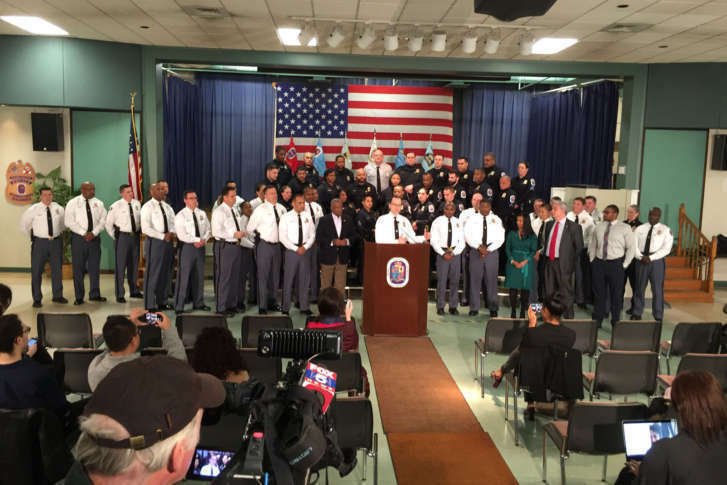 — A program developed by sociologists to help police officers identify and address unconscious bias is being launched next month in Prince George’s County. In a collaborative effort, the police department and University of Maryland researchers have created a training program that uses 3-D virtual reality to immerse officers in various situations while stress levels are measured. The program was announced during a news conference Friday in which researchers, the police chief, command staff and county executive declared it to be a revolutionary advancement that might by adopted by police departments nationwide. “This, in my opinion, is groundbreaking work that takes American policing to a new place,” said Prince George’s County Police Chief Hank Stawinski. “I’m very proud that it all came right here out of Prince George’s County. Addressing the issue of bias isn’t just about race, said U.Md. sociology professor Rashawn Ray, who defined “implicit bias” as any unconscious bias that people are unable or unwilling to admit. “It’s about any form of ‘-ism,’ any form of difference,” Ray said. The 90 virtual reality scenarios in the training program include officer encounters with people who might be hearing-impaired or have autism, those are some people who might not respond to commands from police in a typical fashion. The training will allow officers to learn the difference between someone who’s autistic, for example, versus someone who’s noncompliant or unresponsive. The program includes multiple data points that can factor how officers treat people, such as how much sleep police officers get or the distance they commute to work. “Race, gender, age, how long someone has been in the police department [and] military experience,” Ray said. The police department, university collaboration may prove useful beyond how officers interact with citizen in the community and extend to management practices. “Living in Prince George’s County might be one thing we want to think about when we start thinking about hiring practices in the future,” Marsh said. She and one of the project managers had heated debates about whether officers have more “empathy” if they live in the community they police. Marsh believes they do, based on ride-alongs she did with an officer while collecting data for the program. “We hope that this project spans well beyond just the training and spans more than just this year, but many years to come,” Marsh said. Beginning in March, the implicit bias program will begin to train all 1,700 officers in the Prince George’s Police Department.